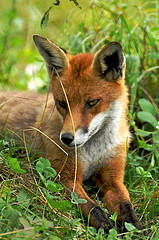 The red fox is the most widespread and numerous predator in Britain. Distribution: found throughout the British Isles including Ireland, but absent from most islands. Also native to the rest of Europe and North America, Asia, North Africa. Introduced to Australia and New Zealand in mid-19th century. Description: dog-like appearance with pointed muzzle and bushy, white-tipped tail ("brush"). Reddish-brown coat; lower legs and backs of ears are black. Size: length; male (dog):- 112 cm. (tail is a third of this). Female (vixen):- 108 cm. Life-span: 18 months to 2 years in the wild; a few may be lucky and live to around eight years. Up to 14 years in captivity. Food: earthworms, rabbits, rodents, birds, insects, fruit, carrion (dead animals); coastal foxes eat gulls' eggs. Urban foxes scavenge for leftovers. The red fox is the most widespread and numerous predator in Britain. Although humans have persecuted the fox for centuries, it is still a very common animal. Its success is mainly due to its ability to live almost anywhere. It has even moved into cities.